Somehow I got confused about this Belgian superband Epysode, thinking they are related to the French Arkan, because the man named Samuel Arkan is at the Epysode’s helm. One has nothing to do with each other. Arkan is into melodic death with a Mid-Eastern twist and Epysode is a big sounding symphonic dark progressive outfit featuring multiple vocalists. Seriously, if you dislike expensive modern production, polished and decked out, then I doubt you will appreciate Fantasmagoria. Epysode has not been long lived, and as you conjecture from my lack of familiarity with the band, I did not hear their debut Obsessions. Yet, for the band’s dedicate circle of followers, mastermind Samuel in his descriptions of Fantasmagoria said that Epysode only got “bigger and better” on their follow-up. And one can certainly hear that a lot of effort has been invested in studio time with this album. Overdriven juicy thundering drums, multilayered guitars, keyboards and classic piano, towering choruses, symphonic elements, overlapping vocal lines, diverse and contributed by at least three or four singers – all of it is combined in one dark, dense, atmospheric and progressive package. The mystery intro File 41-80-2 sets the stage perfectly for a pair of opening tracks, The Arch and Morning Rose, to really blow the hinges off. When I heard them, my mind immediately was reminded of Evergrey, circa In Search of Truth and Recreation Day. No wonder then Tom Englund contributes heavily on Fantasmagoria and is one of the most prominently featured singers, appearing on at least Morning Rose, Raven’s Curse and the title track (and probably more). Having participated in Fantasmagoria Tom may have a tough time comparing notes with Samuel and competing with Epysode on Evergrey’s next album. Once you hear barbed wire rhythms of Morning Rose and Raven’s Curse you will immediately know what I am referring to. Coupled with Englund’s voice, the resemblance is eerie. I am not in possession of a booklet for Fantasmagoria, but it is pretty easy to tell there is a story behind the album. At the same time, Epysode do not put much credence into transitional interludes and the first true respite from a complete song does not come until mid-way through the album with a short dreamy drift Garden of Exile. Before and after then, Fantasmagoria lays full-bodied songs down, brick by brick, with definite heaviness in their chords (Venom) and floating buoyant choruses (Morning Rose, Raven’s Curse, Living Fortress). The songs also benefit from piercing splashing guitar solos (The Arch), dark piano inclusions (Venom) or synths taking lead roles (The Black Parade). The effort is, in fact, so even and competent throughout, the steadiness in Fantasmagoria songs may even get a little tedious at times (The Black Parade, Forgotten Symphony). You never lose appreciation for the overall atmosphere and feeling, but the individual tracks get blended together. In this light, the classical symphony intro to T.H.O.R.N.S. is shortlived, but welcome, diversion, before the song grows to a fist-pumping culmination, and those more distinct stand-out moments are needed not to let the album meld into a big blur. 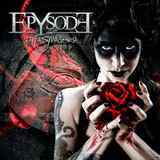 At the same time, Epysode show that they deliver dark and strong music with both male and female (Now and Forever) vocalists, Now and Forever also displaying an interesting swirling buzzing melody in its riffs. Since the album proceeds at almost too steady even pace for over an hour, it is almost inevitable that the highlight, the signature piece, is a goosebumps inducing title track on which Tom Englund and Ida Haukland deliver a romantic duet, first enveloped into quiet piano, then taking on more complete instrumentation. If you love dark atmosphere and not mind that there is equal part production/engineering and metal music in Fantasmagoria this may be your cup of tea. As a big Evergrey fan, I was mostly on board, but in times felt the record could be a little slimmer in scope.